My Stepdad’s A Freakin’ Vampire! It’s a pretty short and vague description. Even though this is a low-budget indie flick, I am still surprised by how little information there is about it online. You would think that they would be going publicity crazy with the DVD release coming up. Guess not. Anyway, what little I did find was actually good. Most of the reviews sing its praises, so that’s a plus. 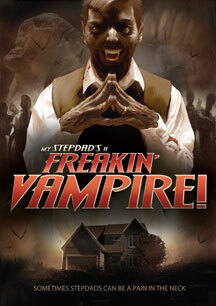 According to one review, My Step-Dad’s a Freakin’ Vampire is campy, but hilarious and entertaining. Others said that it’s a great movie for kids since it’s not actually scary. But most people raved about how great the monster makeup was. So, overall it sounds like a decent monster flick for children – a toned down version of Fright Night. Luckily there’s a trailer to really let us know what the film is about. According the My Step-Dad’s a Freakin’ Vampire Facebook page, the DVD does include a few bonuses. On top of the film, they are also releasing the My Step-Dad’s a Freakin’ Vampire soundtrack. From the samples I heard on Amazon, the score is surprisingly well done, definitely not what I expected from a low-budget project. So, if you’re looking for a family film with excellent music, My Step-Dad’s a Freakin’ Vampire might be perfect for you. What do you guys think? Does it look like a film you want to watch?